Word comes from Joost Goverts at Northrop & Johnson in Palma to say that he has signed the 25m sailing superyacht Shiraz of London for sale. A magnificent Nautor's Swan 82 Raised Salon sailing yacht, Shiraz was originally built for Leonardo Ferragamo and sold in 2004. She has remained with the same family ever since, and crossed the Atlantic just once, in 2012/2013. 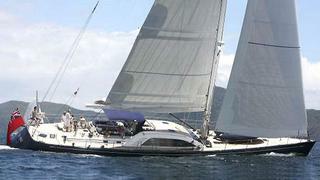 Designed by German Frers, with expertise from Nautor's, the 82RS is both a racer and a cruiser. Shiraz of London achieves this rare combination in one boat, demonstrating that a mix between racing and cruising requirements does not always mean compromise. She has a lightweight hull construction, high tech components, and a powerful rig, combined with a spacious layout and elegant lines. The deck layout is based around a central cockpit with separated work and relaxation areas. Sail handling systems reflect the requirement for efficiency and ease, with power winches and headsail furling. Shiraz of London offers luxurious panoramic views from the raised saloon which seats eight in comfort. Aft are the guests' quarters and owner's area with aft stateroom and two cabins, all finished in Burmese teak wood. Forward of the living area are the galley, one cabin with an en suite bathroom, and crew quarters. She is lying in Mallorca, Spain, and asking €2,295,000. She has Matriculation Tax paid, and with relatively little effort she could be be made a succesful charter yacht. Shiraz of London will be available for viewing at the Palma Super Yacht Show from 30 April to 4 May, 2014.